All that effort getting to the Hurunui River mouth only to be faced with a rough sea and empty net. One of the first laws of whitebaiting is that the river mouth will always be inconveniently placed. Prior to our annual holiday at the Hurunui huts, we called in one day to investigate the river’s latest moods and prepare ourselves for the worst. We would try our luck at Hurunui River whitebaiting. Horrors! From our vantage point on the cliffs, at the point where the Port Robinson walkway begins, we saw a seemingly endless strip of the blue river, following impenetrable native bush until it cut out to sea at the headland this side of Manuka Bay. East Coast Whitebait Fishing Regulations. The previous season the lagoon had stretched up past the Walkway, but climbing down the banks with whitebait gear, wading through shallows and trudging up the shingle to the mouth was a feasible exercise. Sometimes you could even hitch a ride in Rex’s boat, but Harold was never keen, especially after Rex started sinking on one occasion. This year, if you were up the river without a boat, you were going to be in for a sorry time. But those changeable winds and tides which can move monumental amounts of sand came to our rescue. 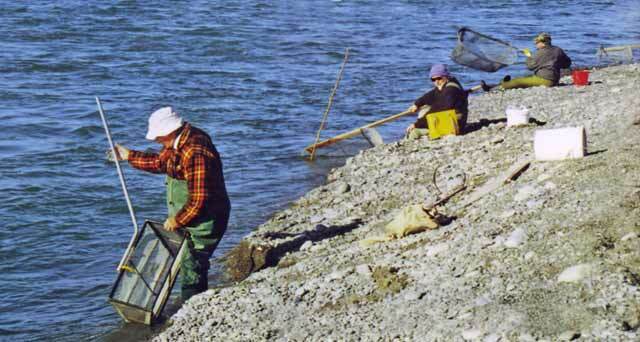 By the time we arrived, quite late in the season, the mouth was blocked to create a long expanse of the lagoon. Fingers of sand marked consecutive outlets as the mouth moved further south, ending up almost opposite the camping grounds. Getting across the ditch could be managed at low tide with the help of waders and a tall friend to carry gear, but one day the two of us were stuck when the wind changed and the lagoon refused to recede. We were marooned on the bar watching the waves washing towards us, with no shelter from a wind-burning nor’wester, and a grizzly total of 49 battered whitebait to show for six hours of patience. Up the river, other whitebaiters watched for signs of action at the mouth, knowing that once the hardy fellows in the surf start tipping, there will be whitebait running. The days slogging away in the waves can be incredibly tiring, but once you’ve picked up a good lift of squirming, tumbling whitebait, you’re the one that’s hooked. We hit the Hurunui at a time when the unpredictability of the mouth and sea conditions seemed to have discouraged the bait. No-one was having much luck; what we painstakingly collected on a pleasant afternoon up by the camp was yellow from too much lazy lagoon living, and a fresh run just had to come. Waiting, waiting, waiting …. .. the philosophical patience of the whitebaiter is well-known. But there are some people who should not be whitebaiters. There’s a terrible tendency for people who are normally amenable, kindly citizens to resent anyone who gets a better spot than them. A cluster of friendly faces can turn into a territorial army of guerillas once the big lifts start coming. Getting your patch has developed into an art form. The complicating factor is that each wash of the tide can create new ripples of jealousy down the line, as conditions change. The day we arrived, a new arrival was assaulted after moving in front of the assaultee. For every uncertainty about the whitebait, there are more uncertainties about how far away or how close you can go to your neighbour. You need to carefully observe each person, and establish his or her degree of neighbourliness before you engage in conversation. This photograph shows how volatile the area is, with the mouth constantly moving and changing. You may decide that silence is the best form of defence. If you decide to test the waters with someone who was there before you, the encounter may go something like this. “Catching a few?” (This is dangerous territory, and probably a rash move). 1. “Nah.” (This NEVER means no. It can mean anything. Possibly ” I wouldn’t tell you anyway” or ”Shove off”). 2. ”Ones and twos” or “Dribs and drabs”. (This person occupies neutral territory and knows that you’ve probably been watching from a distance). 3. “Enough for a feed.” (A potentially. Encouraging enough to stay near, and a person whose strategies can be monitored closely). If you’re on the receiving end there are some useful tricks which can help ward off invaders. 1. If you see someone up the cliff, watching you through binoculars, avoid tipping as much as possible. (Maybe you can walk nonchalantly behind your truck). 2. Look in your net, hold up a couple of fingers to your companions, and shrug elaborately. 3. Lie down on the bank and go to sleep. Watch carefully through eyelashes for the retreat, though this depends on the confidence you have in your gear. (Be careful: weigh up your desire to keep the enemy at bay, with the likelihood that the next wave could wash your cache of whitebait out of the net). 4. If they come walking along the bank towards your bucket, use another bucket (empty) as a decoy and wear a bored expression. Don’t forget that scepticism is essential. By the time you hear about the catch someone else has made, you probably need to halve anything you hear. For example, our slow afternoon by the camp began quite well with Alex getting a lift of several dozen. There’s a sense of rightness when you find the ideal place, with a bit of current at the edge of the net, and we thought it would be a good day. There’s nothing like a good tip! 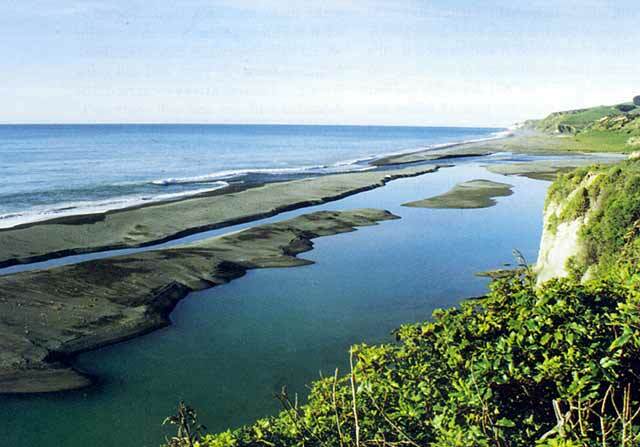 Unfortunately, this wasn’t a good day for Whitebaiting at the Hurunui River mouth. But three of us persevered throughout the incoming and the outgoing tides, and between us, we scraped up only a couple of pounds. On our way back we heard that Alex’s ﬁrst lift had weighed a pound. 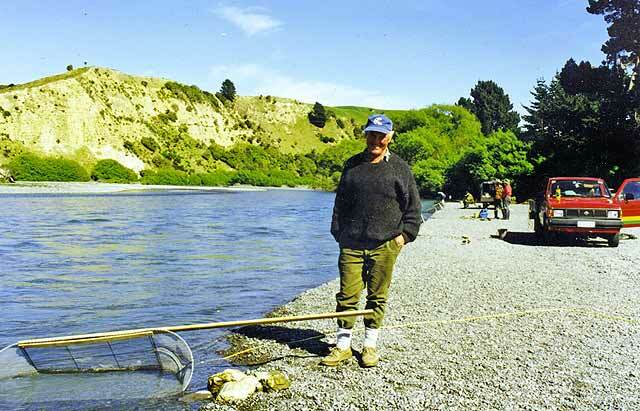 See Hurunui River Salmon and Trout Fishing.